Your mom and dad were married for 46 years. They had a beautiful life together and raised two wonderful children. Dad passed away a few years ago after a long struggle with cancer. Mom just passed away last month. Now they are together. And you, being the designated "responsible child" in the family, need to resolve all their financial affairs. Mom and dad always told you they had everything organized and not to worry. Now you sit, in their home office, which was really your younger sisters’ bedroom while you were kids but was converted to an office when she left for college. You see paperwork in various files. You see a few stacks of bills on the desk. There are file cabinets with more paperwork and you say to yourself: "No problem, I can handle this." After two hours of non stop shuffling you have found no less than three copies of their will, all drafted from different attorneys, another will that is dated just 3 months ago which looks like a draft with notes in the margins. Also, you find a statement about an insurance policy dated from two years ago that looks like it has a death benefit of six figures. You also find their checking account statement from the local bank that is current and has a large sum in it. Have you found everything? How do you proceed from here? Who do you and your sister need to call first? "Maybe this won’t be as easy as you thought" you say to yourself as you take a break and reflect upon your parents. They were savers all their life. They were conservative and planned for the future. "Have I really found everything?" You seem to think so, but you’re just not sure. Here’s the rest of the story they never told you. They actually have 5 different insurance policies. They have investment accounts at two different investment firms and three other bank accounts including one out of state near where they normally vacation every year. You were right to wonder if you found everything. And there is more. They have two safe deposit boxes. You don’t know about either of them. In one is a coin collection. In the other are all their "important papers" like their marriage certificate, your fathers death certificate, the rest of the insurance policies, cash just in case of a rainy day, and two loan documents representing loans they made to family friends when times got tough a few years ago. They never told you about the safety deposit boxes. They never told you where the safety deposit box keys are because they always put keys in the "key drawer" in the kitchen. You know the drawer I am writing about. It’s the drawer in the kitchen with all the other keys that used to work on various locks to various doors and various padlocks that have accumulated over the last 65 years. Don’t worry, you will eventually find these keys. One will be in the "key drawer" the other you will find 6 months from now when you are planning the estate sale. It is hidden in the back of your mothers top dresser drawer. Did they mention what they have hidden in the basement in the ceiling rafters? Cash that you will never find and will stay where it is hidden for another 50 years through three other families who will live in your childhood home before it will be found by a construction worker hired by future family number three to remodel part of the basement into a rec room. Does this scenario sound far fetched? Does it sound too improbable to be true? After working for 21 years with a professional investment advisor and financial planner at a major Wall Street investment firm I can tell you I have heard all of this – and more. The good news is there is a solution to the above scenario that any family can employ, including yours, to save time, money, heartache and create peace of mind. Step one is to help yourself and your parents too by becoming more organized. The most common question I hear regarding organizing the financial matters of a family is: "What’s important? And, how should I go about doing this?" The answer lies in knowing what you have and where it is located. A list of valuable assets and where they are such as: coin collections, gun collections, jewelry, art, vehicles, boats, planes and family air looms. A complete listing of all ownership documents and insurance coverage for vehicles mentioned above as well as any official appraisals and original receipts for collectibles. A listing of each institution where safety deposit box is located including the address, hours of operation, contact person, phone number and email address. This applies to off sight self storage units as well. A note as to where the safety deposit key is located. (They can be expensive and time consuming to replace). A list of the complete contact information for each of the service providers the family deals with such as the CPA, the attorney, the insurance agents, the financial advisors, the bank representatives, the executor of the estate, the beneficiaries of any will, trust or insurance policy, and the funeral parlor where arrangements have been made to name only a few. The second step is fairly easy once the "heavy lifting" of gathering all above mentioned information has been completed. Determine where and how to store this valuable family information. You can put it all in a file at home, a safe at home, or a safety deposit box . These are all traditional approaches. Or, you can look into the latest trend in data storage and secure this information through the use of online "virtual vaults" which have encrypted data storage capabilities. The goal with all this is to create peace of mind and the ability to efficiently and effectively access information when needed from anywhere in the world. Welcome to the age of cloud computing. Step three is the most important step. Take action and complete this important job and review all of your gathered information once a year. In my experience, many families talk about gathering this critical information together and they either never do it, or only do it partially. Granted, there is nothing fun about going about the business of proactively organizing your financial affairs. However, once it is done and once you get in the habit of reviewing it for accuracy annually, you should have greater comfort knowing that no one in your family will have to go through the scenario described at the beginning of this article. Today, in the financially complex world we live in, an ounce of prevention is worth two pounds of cure. Some browsers display this window when you are about to receive a secure document. To enter secure mode, you should click "OK" (or "Continue") to proceed – it simply means that you will begin receiving pages in a highly secure encrypted format. The site is secured with 128-bit encryption. The encryption features of browser software are exceptionally powerful and ensure the security of this data as it is transmitted to our server. A: You can't. Because we don't want you ever to have to worry about ordering from our site without a secure connection, we've designed our system so that it will process orders only with browsers that support secure mode. Please check the latest versions of browsers for updated security features. These browsers are free for downloading. Visit the company's Web site for details. The Fair Credit Act specifies that a credit card company can hold you liable for no more than $50 in fraudulent charges to your account. To take advantage of these protections, you must promptly notify your credit card company of any fraudulent charges and follow any additional procedures required in your agreement with the credit card company. You should then present all of this information along with any bill that we just described to us. If you subscribe to the My Peace of Mind Services, we do collect Personal Information from you including your name, home address, phone number, mailing address, email address, the name of any person you will allow to access your account ("Contact Person"), the name of your advisers, and, for billing purposes, credit or debit card information including credit or debit card type, number, expiration date and billing address. You provide us with this information when you fill out the Member Enrollment Form. In addition, as a member, you may enter financial information and other related information into your Member Profile ("Member Profile Information") by completing the Member Account Information Form. We may place small Internet files known as cookies on your computer’s hard drive when you visit or use our Site. We use "session ID cookies" and "persistent cookies." Cookies enable your computer to interact with our Site. The session cookies expire when you close your browser. We use such cookies for internal record keeping purposes. Generally, most browsers allow you to set your browser to notify you when you receive a cookie and thus you will have the chance to decide whether or not to accept the cookie. If you decide not to accept the cookie, some Web pages may not display properly or you may not be permitted to access certain information on our Site. When you communicate with us by email, voice mail, telephone calls or in writing ("Communication"), we will keep a record of the Communication. We may save and archive the email or other writings that we receive from you on our servers. Your Member Profile Information is not shared with others except as you have specifically authorized us to do so. Because any person to whom you give your User Name and Password will be able to sign-on to your account, such a person will have access to your Member Profile Information by signing-on to your account. When you subscribe to My Peace of Mind, we will send a notice to anyone you have listed as a Contact Person, or to any adviser or beneficiary of a life insurance policy that you specifically ask us to notify. This notice informs the recipient that you have subscribed to My Peace of Mind and that the recipient should contact us in the event of your death or incapacity. This notice will contain your name and mailing address but no other Personal Information and no Member Profile Information. Upon confirmation of your death or disability, as specified in the Member Agreement, we have the right to release the Member Profile Information to your Contact Person and notify the beneficiaries of any life insurance policies that are listed in your Member Profile, unless you have specifically instructed us to not do so. Patent. United States Patent Number 7,860,805, issued to Personal Estate Manager, Inc. on December 24, 2010, protects certain methods that are used in connection with or as a part of the My Peace of Mind Services. Copyright. Except for the information provided by a member that is included in the Member’s Profile ("Member Profile Information"), all Content and the selection and arrangement thereof are copyrighted materials of Personal Estate Manager, Inc, © 2009-2011, ALL RIGHTS RESERVED, or of the original creator of the material. We do not claim any copyright in the Member Profile Information or a subscriber’s personal information. Trademarks. 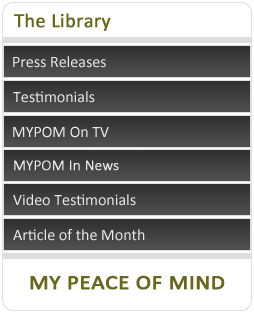 My Peace of Mind and the My Peace of Mind Logo are federally registered trademarks which are owned exclusively by Personal Estate Manager, Inc. In addition, "One Family At A Time," "Your Online Safety Deposit Box," and "Store, Track, Notify" are unregistered trademarks owned by Personal Estate Manager, Inc. All other trademarks, trade names, trade dress, service marks and logos used and displayed on this Site are either the registered or unregistered trademarks of Personal Estate Manager or are owned by third parties. We are not associated with, endorsed by or sponsored by these third parties nor do we endorse or sponsor these third parties. Our written consent is required for any use of our marks. In addition, all page headers, custom graphics, button icons, and scripts are service marks, trademarks, and/or trade dress owned or licensed by us and may not be used without our prior written permission. You may not use any metatags or any other hidden text utilizing the Site’s name, Personal Estate Manager’s name, My Peace of Mind or any other trademarks, service marks or trade dress owned by us without our express written consent. License and Site Access. Permission is granted to access, search, retrieve, print, save, or display limited portions of the Site Content solely for your own personal noncommercial use. You must retain all trademarks, trade names, copyright notices, or any other proprietary notices or legends contained in the Content. You may not otherwise copy, modify, remove, delete, add to, publish, transmit, distribute, republish, upload, sell, or create derivative works from the Content, or in any way exploit any of the Content owned by us, in whole or in part, without our prior written consent. As a subscriber to the My Peace of Mind services, you have the right to copy, modify, remove, delete, add to, publish, transmit, distribute, republish, or otherwise use your Member Profile pages. We shall use commercially reasonable efforts, including, without limitation, the use of back-up or mirror web sites, to make the Site accessible on a 24 hour-7 day a week basis. 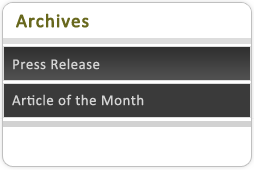 My Peace of Mind shall have the right to periodically conduct routine scheduled maintenance of the Site. During such time, the Site will be inaccessible. We will use reasonable efforts to notify you of any scheduled maintenance of the Site. However, in the event the Site is inaccessible, our liability is limited in accordance with the disclaimers set forth herein.